In order to get on with your business, the only real choice is to rotely click the not recommended link. Using iLO doubles the annoyance because the prompt appears again when subsequently opening a remote console window. The solution, of course, is to install signed SSL certificates to stop web browsers from complaining. 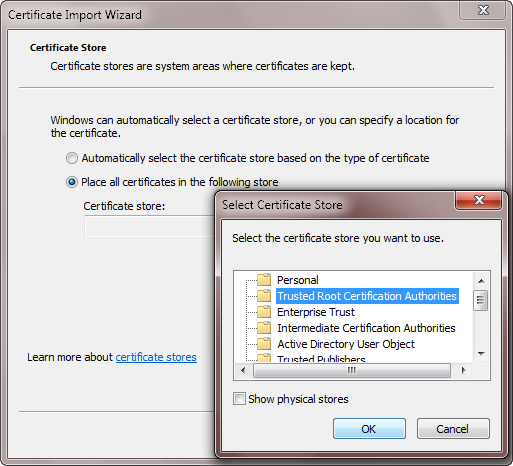 Given a private Certificate Authority (CA), installing signed certificates is normally an interactive process that involves some clicking and pasting. Take a look at these articles from Jason Boche and Mike Laverick for additional background. The one-by-one manual approach is fine for a handful of systems, but setting up a c7000 chassis full of 16 blade servers is an opportunity begging for automation. In this article I will show you how to become your own CA and write a simple script that automatically deploys a signed SSL certificate to an HP iLO controller. Keep in mind that the process described here works best for environments where a known group of individuals needs to administer servers, such as in a lab. For production systems with many users, certificates from a trusted CA are much more appropriate. Have a look at /etc/ssl/openssl.cnf to change certain default behaviors — optional. Next you need to tell your web browser(s) to trust your private CA — you’ll also need to distribute this certificate to other administrators on your team so they can do the same. Download the HP Lights-Out XML PERL Scripting Sample for Linux in order to get the locfg.pl script. You may need to install a couple of additional Perl modules to get everything working — see the documentation if you get stuck. Hint: you can most likely use the package manager for your Linux distribution to add the modules. After all of the files are saved, chmod +x the shell script and execute it passing the hostname of an iLO controller as the sole argument. If everything works, repeat for each server or wrap it up in a loop and deploy certificates en masse. 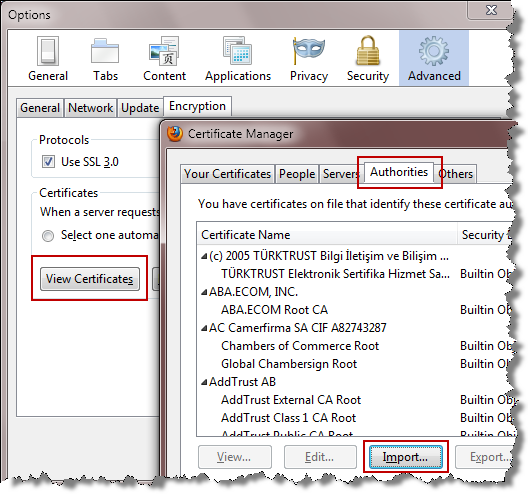 It’s easy enough to use your new CA to manually sign certificates from other web services such as Microsoft IIS or the HP Onboard Administrator (OA) controllers. Use the contents of the resulting output file to complete the original request. 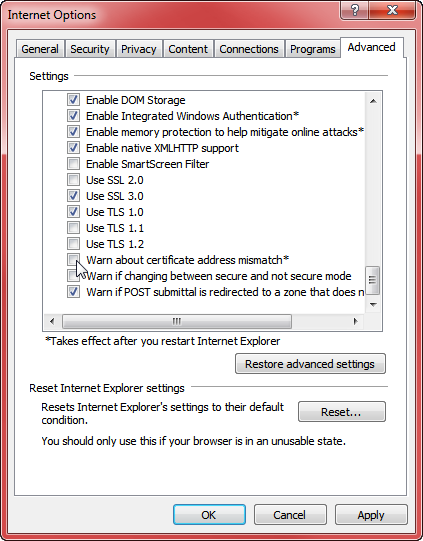 Browsers are very particular about server names — if they do not match the certificate exactly, a warning will be thrown. One key decision to make when using the script above is whether to use short hostnames or FQDNs — I prefer the former. Another issue specific to HP BladeSystem is that when an iLO console is launched from the Onboard Administrator, the iLO IP address is used and not the hostname. Fortunately, this overcome by adding the subjectAltName parameter to the certificate. If you are tired of dismissing the warning messages that accompany self-signed certificates, it might be time to set up your own private CA. By investing some time up front, it becomes simple to deploy new certificates when adding servers. Very cool.. Any idea if a multi-domain cert would work OK for this? Could save a bunch of hassle.. The iLO SSL certificate handling is not exactly leading edge. Most likely not. Thanks for the script(s). I figured this was possible, but never took the time to dig deeper. Since I prefer FQDN’s, mostly due to proxy rules in my browser filtering on *.mycompany.com, I simply added “DNS:$ILO” to the subjectAltName in auto-ilo-cert.sh. Now, I can use either the short, FQDN or IP. I think that solution explained could work only if SSL non auto-signed certificates are already in place. So, even if I have misunderstood something, you cannot start deploying non self signed certificates from scratch. It’s like egg and chicken story. This is a pretty old article, not sure if anything changed with the underlying components since then, but when I initially did this it worked as described.